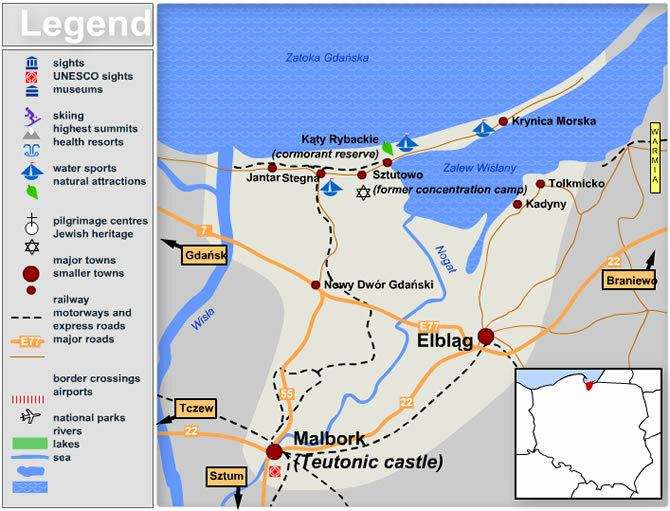 East of Gdansk, along the Baltic coast, is Zulawy Wislane, the region of the Vistula delta. It is known for its fertile soil split by many channels, and for being the lowest area in Poland with depressions that are up to 1.8 m below sea level. The Vistula Spit is a thin strip of land that forms a border between the Zulawy Wislane and the Baltic Sea, separating the Vistula Lagoon from the sea (or, more precisely, from Gdansk Bay). The tip of the Vistula Spit actually belongs to Russia (Kaliningrad Exclave). Deservedly popular among tourists, the Vistula Spit attracts mostly Poles and Germans who want to visit their former hometowns. Most of the resorts are small and the beaches are less crowded than along other parts of the coast. The largest and best developed in terms of tourism is Krynica Morska, situated in the middle of the Spit. 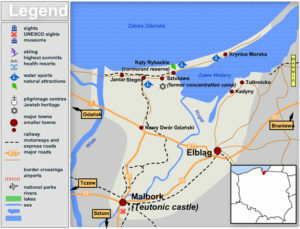 While Zulawy Wislane is not a typical holiday region, you can find some great attractions like Malbork Castle or the old town of Elblag and, of course, the many traces of the German and Dutch populations who once lived there. There is no railway, so it is best to first head to Gdansk, which is well connected with other towns of Poland and Europe thanks to the airport in Rebiechowo and the railway. Take a car or a bus and head east along road 501. Buses to Krynica are quite frequent, and the journey takes 1 hour 40 minutes. If you come from Warsaw you can take road E77 (change to the 501 in Nowy Dwor Gdanski) or by bus (e.g. Polski Express, starting from Warsaw Centralna Railway Station), passing through Krynica via Stegna and Katy.